The Purple Pomegranate, a fine craft specialty store, is featuring work by Whitefish couple, Zach Deverman and Rachael Riggle during the month of October. This past year, they started Great Bear Woodworks. They both love the outdoors and Zach is especially fond of the Great Bear Wilderness hence the name “Great Bear Woodworks”. Their main focus is on functional art. 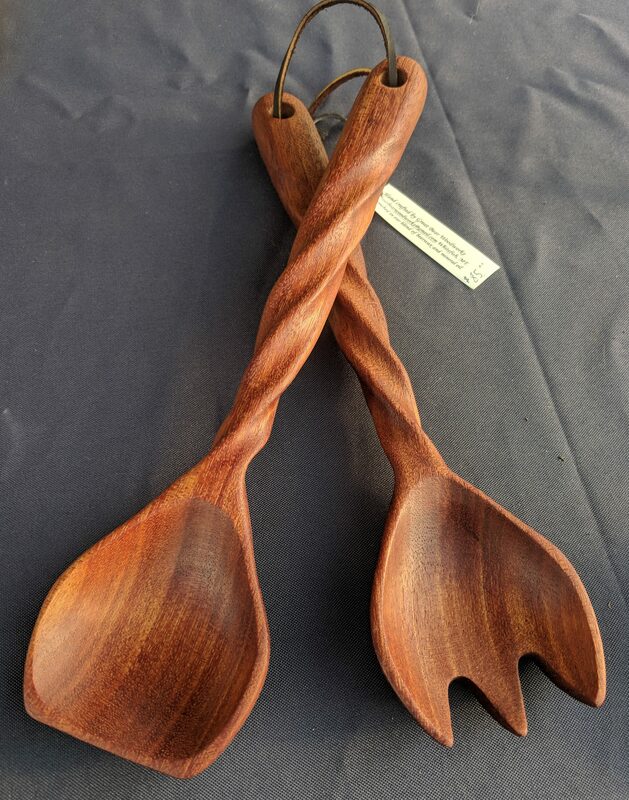 Zach and Rachael hand craft various wooden wares such as spoons, spatulas, cutting boards and bowls. They often use various stones for inlay work, with some recent favorites being malachite, turquoise, and obsidian. All of their utensils are created to be both aesthetically pleasing and ergonomically correct in the kitchen. Zach and Rachael both love to cook so they try their best to design useful tools for the kitchen which are still beautiful. Join us for the opening reception during Whitefish Gallery Night, Thursday, October 4, 2018 from 6-9 PM. Zach and Rachel’s work will be displayed during the opening and throughout the month of October.